IT IS hard to overestimate the impact of “An Inconvenient Truth”, not least on the film industry. Al Gore’s 2006 feature-length admonition on the effects of global warming grossed nearly $50m, making it one of the most successful documentaries after “Fahrenheit 9/11” and “March of the Penguins”. Judging by the films on offer at the Sundance film festival this month, every documentary maker now wants to be the next Mr Gore. “The End of the Line” uses the same lyrical underwater footage as nature documentaries, such as “The Blue Planet”. But rather than lulling the audience into a false sense that all is well in the oceans, it catches the viewer’s attention with meditative camerawork and lush, dramatic music and then reveals the inconvenient truth about the impact of over-fishing on the oceans. The film unfolds like a mystery, with Mr Clover as detective. The film-makers travel to Nova Scotia, the Bahamas, Tokyo and the Mediterranean, as well as to a small village in west Africa whose supply of fish has been halved in recent years as a result of over-fishing. Ignorance, corruption and greed all play a part. “The Cove” follows Richard O’Barry, who trained the dolphins in “Flipper”, a popular 1960s television show. Ever since, Mr O’Barry has worked to stop dolphins from being captured and sent to amusement parks. In “The Cove” he focuses on trying to prevent the slaughter of 23,000 dolphins a year in a bay off Taiji, Japan. Local fishermen, who believe dolphins are responsible for their shrinking catch, do all they can to thwart Mr O’Barry’s efforts. 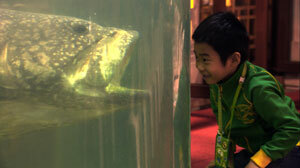 via Sundance film festival: Underwater treasures | The Economist.